Imagine growing up with severe hearing loss, unable to communicate with others. While you’re imagining, you also can’t learn because there aren’t signing teachers in your village school. Yours would be a lonely world. 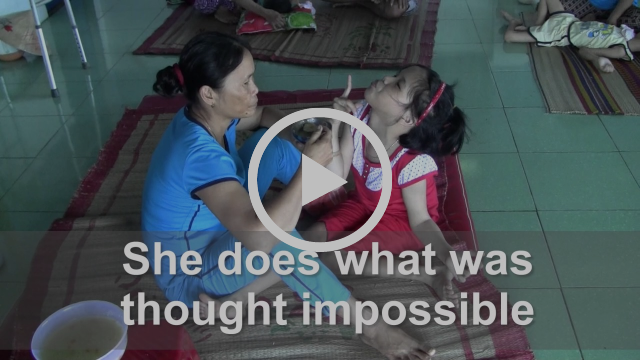 But it’s a very real world for poor, deaf children who live in the Vietnamese countryside. They’re lonely no more. For eight children at New Beginnings School for the Deaf, He has transformed their lonely lives into vibrant ones. Having learned sigh language, the children now communicate with others. Having learned math and writing, they have the skills that others do. To transform these lives, Orphan Voice pays two teachers, buys lunches for the children and provides their school supplies. It’s not cheap. We need your help to keep New Beginnings School for the Deaf open and the discipleship continuing. Please sow a generous gift into these children today by donating HERE or by mailing your gift to Orphan Voice, P.O. Box 910410, Lexington, Kentucky 40591. Look at the smile of a child who is overcoming cerebral palsy and who now walks! 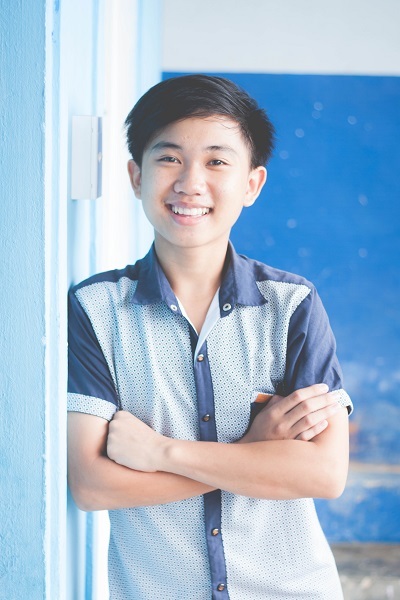 We’ve told you about Trinh, but her story is so amazing that it’s worth a re-tell. A loving Father is behind it all. 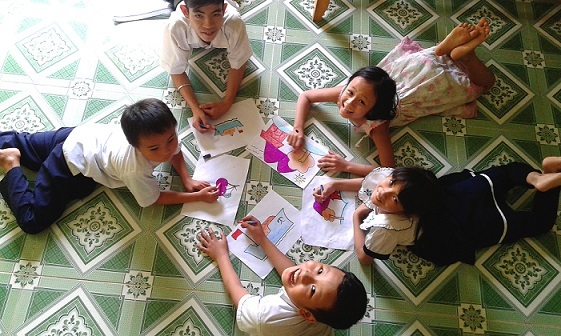 Each day at the Phu Ninh Therapy Center, Orphan Voice provides for three therapists, equips the Center with therapy equipment and buys lunches for the children. We need your help to continue this life-changing ministry. Without it, these children will lack services and some will not live beyond their beds. To bless and help a special needs child, donate HERE or mail your gift to Orphan Voice, P.O Box 910410, Lexington, Kentucky 40591. Orphan Voice takes its responsibility for the 21 children living at Promise House seriously. In the last quarter of 2016, our staff along with paid and volunteer teachers, provided 144 tutoring sessions. More importantly, our staff mentored children in small group settings 24 times. That’s 24 opportunities for the Father to pour out His healing love to damaged lives. He faithfully does that, and as He does so, He restores their lives to what He intended them to be! As we provide 166 tutoring and mentoring sessions; as we buy food for the caregivers and children each day; as we take them to the hospital; as we buy their school supplies and clothes; and as we hold their hands and dry their tears, we quickly realize that we can’t do anything without you. We need you to lend us your faith and support this work. Help us provide for these selected ones of “the least of these” by donating HERE or by mailing your support to Orphan Voice, P.O. Box 910410, Lexington, Kentucky 40591. “Lan’s uncle asked her if she wanted to go to China with him on vacation. She quickly said “yes.” Lan’s mom knew what was happening. Once in China, Lan was sold as a bride to a middleman for $500. 12 year old “Linh” was riding home at night on her bike along a country road from the village school. Suddenly, a man jumped from the shadows and raped her. Little “Linh” never understood what happened and never spoke of it – until her grandmother noticed her growing stomach. Real girls – who suffered in real ways. We know them personally. Through Orphan Voice’s Victory House program, vulnerable girls who’ve aged out of orphanages but have no place to live, are given a home, food to eat and job training so that they can provide for themselves. With the job comes safety. At Orphan Voice’s Hope House, girls who have been raped or trafficked find safety, a loving home and practical help as they recover from their trauma. Through love, brokenness is turned into beauty. 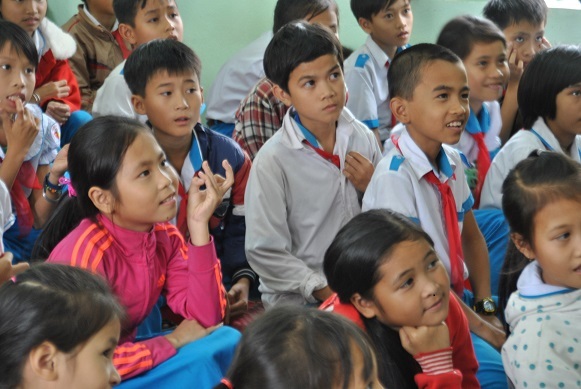 Through Orphan Voice’s More Precious Than Gold anti-trafficking seminars, tens of thousands of children hear about the “ways and wiles” of traffickers. More importantly, they learn how to protect themselves and who to call if they suspect that a trafficker is near. Through you, Orphan Voice is protecting young girls from sexual abuse. But we need your help to continue. Can you give sacrificially today to protect the innocent? To do so, donate HERE or mail your support to Orphan Voice, P.O. Box 910410, Lexington, Kentucky 40591.